Anafranil™ (clomipramine hydrochloride) Capsules USP is indicated for the treatment of obsessions and compulsions in patients with Obsessive-Compulsive Disorder (OCD). The obsessions or compulsions must cause marked distress, be time-consuming, or significantly interfere with social or occupational functioning, in order to meet the DSMIII-R (circa 1989) diagnosis of OCD. Obsessions are recurrent, persistent ideas, thoughts, images, or impulses that are egodystonic. Compulsions are repetitive, purposeful, and intentional behaviors performed in response to an obsession or in a stereotyped fashion, and are recognized by the person as excessive or unreasonable. 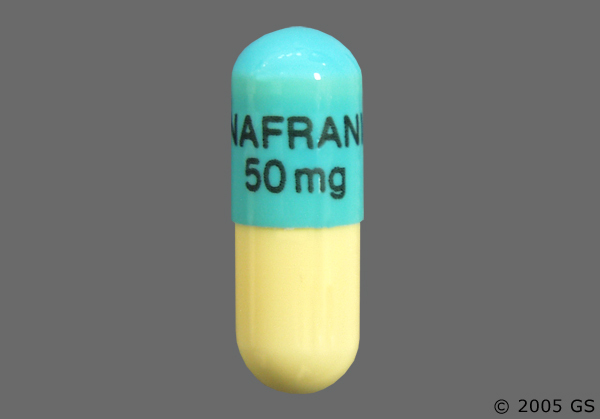 Anafranil is contraindicated in patients with a history of hypersensitivity to Anafranil or other tricyclic antidepressants. Monoamine Oxidase Inhibitors (MAOIs): The use of MAOIs intended to treat psychiatric disorders with Anafranil or within 14 days of stopping treatment with Anafranil is contraindicated because of an increased risk of serotonin syndrome. The use of Anafranil within 14 days of stopping an MAOI intended to treat psychiatric disorders is also contraindicated. Starting Anafranil in a patient who is being treated with linezolid or intravenous methylene blue is also contraindicated because of an increased risk of serotonin syndrome. Myocardial Infarction: Anafranil is contraindicated during the acute recovery period after a myocardial infarction. Clinical Worsening and Suicide Risk: Patients with major depressive disorder (MDD), both adult and pediatric, may experience worsening of their depression and/or the emergence of suicidal ideation and behavior (suicidality) or unusual changes in behavior, whether or not they are taking antidepressant medications, and this risk may persist until significant remission occurs. Suicide is a known risk of depression and certain other psychiatric disorders, and these disorders themselves are the strongest predictors of suicide. There has been a longstanding concern, however, that antidepressants may have a role in inducing worsening of depression and the emergence of suicidality in certain patients during the early phases of treatment. Pooled analyses of short-term placebo-controlled trials of antidepressant drugs (SSRIs and others) showed that these drugs increase the risk of suicidal thinking and behavior (suicidality) in children, adolescents, and young adults (ages 18 to 24) with major depressive disorder (MDD) and other psychiatric disorders. Short-term studies did not show an increase in the risk of suicidality with antidepressants compared to placebo in adults beyond age 24; there was a reduction with antidepressants compared to placebo in adults aged 65 and older. Screening Patients for Bipolar Disorder: A major depressive episode may be the initial presentation of bipolar disorder. It is generally believed (though not established in controlled trials) that treating such an episode with an antidepressant alone may increase the likelihood of precipitation of a mixed/manic episode in patients at risk for bipolar disorder. Whether any of the symptoms described above represent such a conversion is unknown. 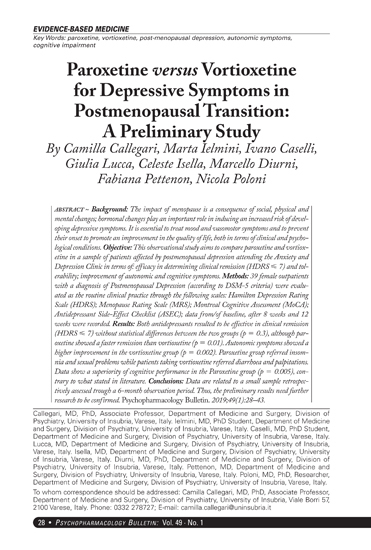 However, prior to initiating treatment with an antidepressant, patients with depressive symptoms should be adequately screened to determine if they are at risk for bipolar disorder; such screening should include a detailed psychiatric history, including a family history of suicide, bipolar disorder, and depression. 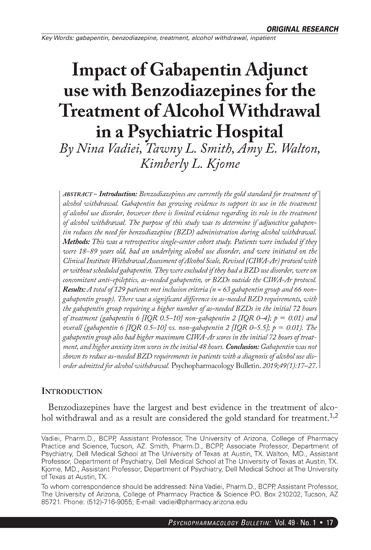 It should be noted that clomipramine hydrochloride is not approved for use in treating bipolar depression. Serotonin Syndrome The development of a potentially life-threatening serotonin syndrome has been reported with SNRIs and SSRIs, including Anafranil, alone but particularly with concomitant use of other serotonergic drugs (including triptans, tricyclic antidepressants, fentanyl, lithium, tramadol, tryptophan, buspirone, and St. John’s Wort) and with drugs that impair metabolism of serotonin (in particular, MAOIs, both those intended to treat psychiatric disorders and also others, such as linezolid and intravenous methylene blue). Seizures During premarket evaluation, seizure was identified as the most significant risk of Anafranil use. Suicide: Since depression is a commonly associated feature of OCD, the risk of suicide must be considered. Prescriptions for Anafranil should be written for the smallest quantity of capsules consistent with good patient management, in order to reduce the risk of overdose. Cardiovascular Effects: Modest orthostatic decreases in blood pressure and modest tachycardia were each seen in approximately 20% of patients taking Anafranil in clinical trials; but patients were frequently asymptomatic. 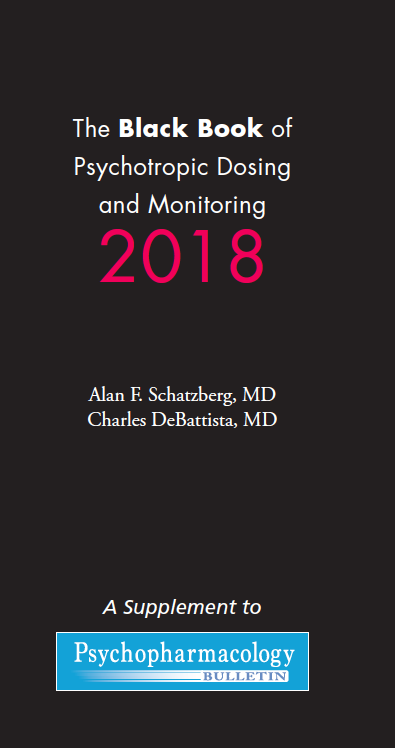 Among approximately 1400 patients treated with CMI in the premarketing experience who had ECGs, 1.5% developed abnormalities during treatment, compared with 3.1% of patients receiving active control drugs and 0.7% of patients receiving placebo. The most common ECG changes were PVCs, ST-T wave changes, and intraventricular conduction abnormalities. These changes were rarely associated with significant clinical symptoms. Nevertheless, caution is necessary in treating patients with known cardiovascular disease, and gradual dose titration is recommended. Psychosis, Confusion, and Other Neuropsychiatric Phenomena: Patients treated with Anafranil have been reported to show a variety of neuropsychiatric signs and symptoms including delusions, hallucinations, psychotic episodes, confusion, and paranoia. Because of the uncontrolled nature of many of the studies, it is impossible to provide a precise estimate of the extent of risk imposed by treatment with Anafranil. As with tricyclic antidepressants to which it is closely related, Anafranil may precipitate an acute psychotic episode in patients with unrecognized schizophrenia. Mania/Hypomania: During premarketing testing of Anafranil in patients with affective disorder, hypomania or mania was precipitated in several patients. Activation of mania or hypomania has also been reported in a small proportion of patients with affective disorder treated with marketed tricyclic antidepressants, which are closely related to Anafranil. Hepatic Changes: During premarketing testing, Anafranil was occasionally associated with elevations in SGOT and SGPT (pooled incidence of approximately 1% and 3%, respectively) of potential clinical importance (i.e., values greater than 3 times the upper limit of normal). In the vast majority of instances, these enzyme increases were not associated with other clinical findings suggestive of hepatic injury; moreover, none were jaundiced. Rare reports of more severe liver injury, some fatal, have been recorded in foreign postmarketing experience. Caution is indicated in treating patients with known liver disease, and periodic monitoring of hepatic enzyme levels is recommended in such patients. Hematologic Changes: Although no instances of severe hematologic toxicity were seen in the premarketing experience with Anafranil, there have been postmarketing reports of leukopenia, agranulocytosis, thrombocytopenia, anemia, and pancytopenia in association with Anafranil use. As is the case with tricyclic antidepressants to which Anafranil is closely related, leukocyte and differential blood counts should be obtained in patients who develop fever and sore throat during treatment with Anafranil. Central Nervous System: More than 30 cases of hyperthermia have been recorded by nondomestic postmarketing surveillance systems. Most cases occurred when Anafranil was used in combination with other drugs. When Anafranil and a neuroleptic were used concomitantly, the cases were sometimes considered to be examples of a neuroleptic malignant syndrome. Sexual Dysfunction: The rate of sexual dysfunction in male patients with OCD who were treated with Anafranil in the premarketing experience was markedly increased compared with placebo controls (i.e., 42% experienced ejaculatory failure and 20% experienced impotence, compared with 2.0% and 2.6%, respectively, in the placebo group). Approximately 85% of males with sexual dysfunction chose to continue treatment. Weight Changes: In controlled studies of OCD, weight gain was reported in 18% of patients receiving Anafranil, compared with 1% of patients receiving placebo. In these studies, 28% of patients receiving Anafranil had a weight gain of at least 7% of their initial body weight, compared with 4% of patients receiving placebo. Several patients had weight gains in excess of 25% of their initial body weight. Conversely, 5% of patients receiving Anafranil and 1% receiving placebo had weight losses of at least 7% of their initial body weight. 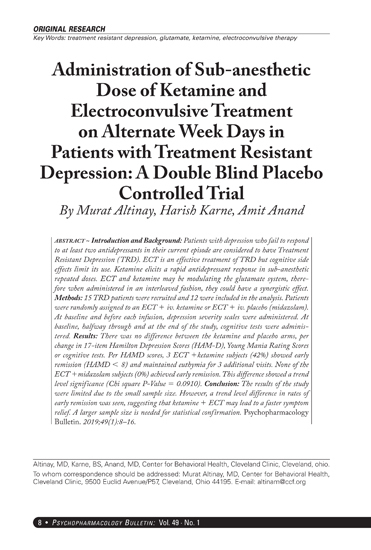 Electroconvulsive Therapy: As with closely related tricyclic antidepressants, concurrent administration of Anafranil with electroconvulsive therapy may increase the risks; such treatment should be limited to those patients for whom it is essential, since there is limited clinical experience. Surgery: Prior to elective surgery with general anesthetics, therapy with Anafranil should be discontinued for as long as is clinically feasible, and the anesthetist should be advised. Commonly Observed The most commonly observed adverse events associated with the use of Anafranil and not seen at an equivalent incidence among placebo-treated patients were gastrointestinal complaints, including dry mouth, constipation, nausea, dyspepsia, and anorexia; nervous system complaints, including somnolence, tremor, dizziness, nervousness, and myoclonus; genitourinary complaints, including changed libido, ejaculatory failure, impotence, and micturition disorder; and other miscellaneous complaints, including fatigue, sweating, increased appetite, weight gain, and visual changes. Leading to Discontinuation of Treatment: Approximately 20% of 3616 patients who received Anafranil in U.S. premarketing clinical trials discontinued treatment because of an adverse event. Approximately onehalf of the patients who discontinued (9% of the total) had multiple complaints, none of which could be classified as primary. Where a primary reason for discontinuation could be identified, most patients discontinued because of nervous system complaints (5.4%), primarily somnolence. The second-most-frequent reason for discontinuation was digestive system complaints (1.3%), primarily vomiting and nausea. There was no apparent relationship between the adverse events and elevated plasma drug concentrations. Incidence in Controlled Clinical Trials: The following table enumerates adverse events that occurred at an incidence of 1% or greater among patients with OCD who received Anafranil in adult or pediatric placebocontrolled clinical trials. The frequencies were obtained from pooled data of clinical trials involving either adults receiving Anafranil (N=322) or placebo (N=319) or children treated with Anafranil (N=46) or placebo (N=44). The prescriber should be aware that these figures cannot be used to predict the incidence of side effects in the course of usual medical practice, in which patient characteristics and other factors differ from those that prevailed in the clinical trials. Similarly, the cited frequencies cannot be compared with figures obtained from other clinical investigations involving different treatments, uses, and investigators. The cited figures, however, provide the physician with a basis for estimating the relative contribution of drug and nondrug factors to the incidence of side effects in the populations studied. Drug Interactions: The risks of using Anafranil in combination with other drugs have not been systematically evaluated. Given the primary CNS effects of Anafranil, caution is advised in using it concomitantly with other CNS-active drugs. Anafranil should not be used with MAO inhibitors. The plasma concentration of CMI has been reported to be increased by the concomitant administration of haloperidol; plasma levels of several closely related tricyclic antidepressants have been reported to be increased by the concomitant administration of methylphenidate or hepatic enzyme inhibitors (e.g., cimetidine, fluoxetine) and decreased by the concomitant administration of hepatic enzyme inducers (e.g., barbiturates, phenytoin), and such an effect may be anticipated with CMI as well. Administration of CMI has been reported to increase the plasma levels of phenobarbital, if given concomitantly.